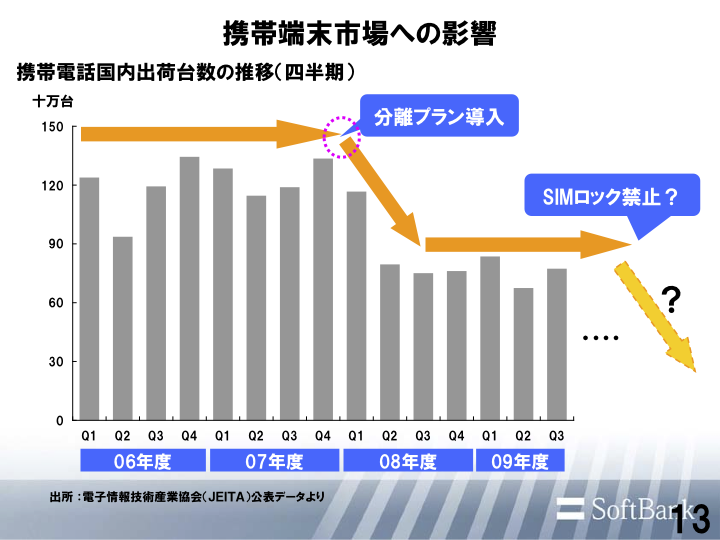 Japan Mobile Tech: Can the MIC really "oblige" Japanese carriers to unlock phones? Can the MIC really "oblige" Japanese carriers to unlock phones? The Jiji Press is reporting that the Ministry of Internal Affairs and Communications (MIC) is going to “oblige” carriers to remove SIM locks on handsets. How, exactly, the MIC plans to do this is a mystery to me. The MIC issues “guidelines” that the carriers are supposed to follow but don’t really have to. Here is an excerpt from the shorther Japanese version of the article because the English version is only hosted in a place to which I no longer link. The article goes on to say that the MIC plans to convene a panel of experts from the 30th to devise a detailed strategy by the end of the current fiscal year (next March). In Japan, by contrast, the major carriers put SIM locks on their most popular handsets and offer sizable discounts on them to lure new subscribers. Smartphone users whose Internet use is limited and long-time subscribers are both upset about the expensive monthly rates being used to finance such discounts. Thing is, the MIC has already obliged carriers to separate hardware discounts from monthly fees. Those of you who have been in Japan for a number of years should clearly remember the hoopla surrounding the death of the zero-yen keitai that this was supposed to cause, and when SIM unlocking was first debated, Softbank used the impact on handset sales as justification for keeping SIM locks. The Gloom and Doom cometh! So carriers are supposed to separate subisdy costs from service costs but consumers complain that they don’t do this. There’s always wiggle room for the carriers. This time, imagine that somehow the MIC manages to make carriers unlock all phones. In response, they’ll just lock down the APNs like Apple does with the majority of their iPhones, making it nearly impossible (without hacking and warranty voiding) to get a data connection on another carrier. Docomo already cripples tethering in this exact way when their unlocked phones are used with any other provider, even with MVNOs using Docomo’s network. It will be a slap in the face if they unlocked phones but didn't let you change the APN to connect anywhere else. Honestly if you pay the full handset cost up front or pay it off after you leave, I don't see why Softbank would say it's a loss of their revenue. My point with that was that Apple makes it very easy for the carriers to abuse. Android also automatically sets APNs based on SIM card MCC and MNC (e.g., 44010 for Docomo). Basically, I don't like it that the settings that I can adjust change based on what SIM I put it in. Apple can do just like Android and have settings based on SIM card, but please allow users to always modify settings. That aside, I agree with you fully that the MIC really doesn't understand/appreciate what is going on. I know for a fact that there was already talk about "APN locks" when the MIC first starting mulling over SIM unlocking guidelines 4-5 years ago. In general Japanese laws and regulations can be overly narrow, creating the situation for 脱法. The way the MIC should phrase it is not with "SIM lock" but language such as "any means to prevent a phone from functioning on a different network"
But the MIC won't do that. In fact I just called DoCoMo. Curious since with my wife's phone (Xperia) I was able to convert her to Mopera and she's able to use any phone she wants. But with me and my iPhone I can't. While I _could_ change my account to Mopera, DoCoMo has locked out the APN settings on the iPhone so I can't put them in anywhere. Well then I guess moving to DoCoMo wasn't the best idea, at least if I wanted to stay with an iPhone. Either get another phone come time upgrade, or find a new carrier when my contract is up. Or hope that the MIC makes some broad changes. Somehow I'm thinking a government office has very little power over private business in Japan. The "carrier profile" that DoMoDoMo mentioned above would be the way to make the change, assuming you haven't already tried it. If you have and it didn't work, then you are indeed locked out. I recall dissecting a docomo carrier bundle and I seem to recall that the only allowed APN was spmode, but I really don't understand fully what are the fields are in the xml. I think the correct term for 'carrier profile' would be carrier bundle or 'carrier plist'. It looks like carrier bundles cannot be edited easily, leaving the user with a locked down phone if the carrier decided to restrict access to APN settings. Not sure if the below website would be helpful.